I have spent some time lately trying to find a solution to get my 7 inch eGalax touchscreen to work with Raspbian(Debian Wheezy) in XBMC 12 Frodo and finally got it working as I wanted. Edit: Download the latest image from the top right corner of this blog(username: pi, password: a). 1. Get latest Raspbian image from here and flash it to an SD card. 2. Build your own kernel with eGalax touchscreen support, like in this post(you will only need to replace kernel.img file and /lib/modules and /lib/firmware folders on the SD card). 3. Build XBMC 12 on Raspberry PI using this tutorial. Note: After downloading XBMC archive, get this archive and unpack it anywhere. Create a new file /home/pi/touchscreen_axes_calib on Raspberry PI. It will contain four values for the axes calibration and one value for swapping axes. The simplest way to swap axes is to switch the four wires cable plug's orientation which comes from the touchscreen to the touch controller. Here is how the calibration was done. In the picture above, we see that "touch panel values frame" differs from "touch panel physical size frame". When we are pressing the touch we are moving in the "touch panel physical size frame" but when the touch screen is not calibrated the arrow from XBMC is in another place. 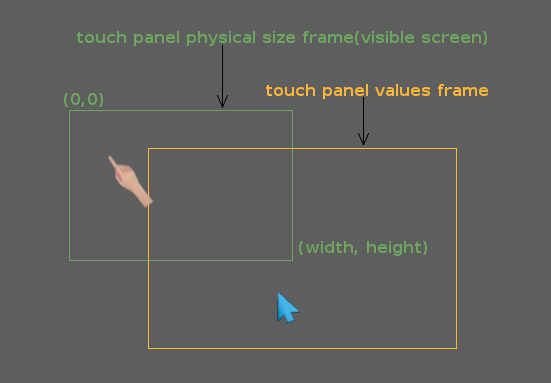 "touch panel physical size frame" is the screen starting from (0,0) on the left top corner and going to (width, height) in the right bottom corner. "touch panel values frame" is the frame which contains all the number the touch controller is giving. We see that these frames differs a lot. Our main scope is to overlap the "touch panel values frame" to the "touch panel physical size frame". "touch panel values frame" width and height are coming from your XBMC resolution(I have width=1280 and height=720). b. Translate the "touch panel values frame" to the left and up, to match "touch panel physical size frame". I didn't find a logical method to do this, because we don't know exactly "where is" the "touch panel values frame", so, in order to find calib_x_d and calib_y_d you have to first set them both to zero and then start XBMC. Now, put some sharp pointer on the screen and observe the distances between the cursor on the screen and your pointer's position. Try to approximate these x and y deviations(measured in pixels) and put them in the /home/pi/touchscreen_axes_calib file. c. Revert direction of axes. This is done in the software(from patches). After I have successfully calibrated the touchscreen I have discovered that single click was not possible from the touchscreen, just double click. After digging through the code, I have found that this was caused by drag action which was triggered because the previous values of the touch were far(more than 5 pixels) from a new press. For example, at the start of the program, cursor is set at 0,0 coordinates; if user is trying to press a button, let's say at 100, 300, the program(XBMC) will calculate the distance between these two points and will find out that this is greater than 5. (100-0)x(100-0) + (300 - 0)x(300-0) is greater than 5x5 XBMC will treat this as a drag event. This drag issue is not caused when you double click, because the previous point in the second click action is very close to the second click point. This also works for mouses, because the previous value of the pointer is always very close to the new value of the pointer(because mouse's pointer drags on the screen and it doesn't jump - so each new value is very close to the previous one). When the user is pressing the screen(x,y), the touch values are being set to (screen_width+1, screen_height+1 -> outside of the visible screen) just at the first event read(which is BTN_TOUCH PRESS). After this event, the program will receive multiple X and Y absolute values events. The first two events, one for X and one for Y are used to set the previous X value, respectively previous Y value to the current X respective current Y values. And from now on distance is measured and this is preventing no unwanted drag action. The user's finger/pointer will not stay at a single point, because the touchscreen's lack of precision, so it will move around 5-6 pixels in x and y directions. I have also set the click distance to 7. You can change this by changing click_confines value in xbmc/input/MouseStat.h. Originally it was set to 5, but this is not very good for touch screens(I had to click with a sharp pointer and with my nail always, but with a value of 7 I can click with my finger with a slight touch -> really nice). Very nice! I'd love to be able to implement this in Raspbmc, would be curious if the same can be applied to building an install of it. This should work with Raspbmc as well, because, in my understanding, Raspbmc is Debian with no X server and XBMC. Is the screen capacitive or resistive? The touch screen is rezistive, but the response is very good with my patches. You don't have to use your nail or some pen. I recently attempted this and got it to run well in lxde, but not xbmc. Does this work in xbmc standalone? Yes, this is working with xbmc standalone. You don't need X server for this. My patches are affecting XBMC's source code and XBMC on Raspberry PI runs in the framebuffer so it is not related to X server. It receives the events directly from the kernel. What was the exact ebay listing that you purchased the screen from? I can't seem to find eGalaxy.. Thanks! You have to look in the item's description to see if it has touchscreen and touchscreen controller. You won't find eGalax name, but almost all cheap touchscreen controllers on eBay are eGalax, but if they are not you certainly have drivers implemented in the linux kernel, you just have to activate them. Got it working right out of the box. It is working out of the box on Xserver and also on XBMC, but they cannot be calibrated, unless you put my patches. Hey i got that one from chalc elec, and tried with raspbian(touch worked)-> xbmc (touch didnt work) then with openelec xbmc and raspbmc where the touch didnt work. Would your patch make the touch work on the xbmc? sorry if its a dumb question im new to this. Yes, my patches should work with any touch screen in XBMC. You just have to be sure that the kernel module for your touch screen is loaded(and it should be because you said that it worked on Raspbian). I suggest you to download my latest image and play with the calibration. Would this work with Android on the Raspi? This would be great for a roll your own car head unit based on Android. I don't know about Android's kernel, but it should work, but also, in my knowledge, Android is not a very good build for Raspberry PI, at least at this moment. Thanks so much for these postings, without them I was totally stuck. Option "Calibration" "1818 80 246 1831"
Option "Calibration" "72 1816 1808 244"
You can play with these numbers after you build XBMC. Can you please post the result of xinput_calibrator? Also, can you please try to swap axes by swapping the cable which comes from the display into touch screen controller? Option "Calibration" "1979 227 242 1798"
In XBMC the X axis is pretty much correct now, but the Y axis seems to be swapped around, so now when I move my finger up the XBMC screen, the pointer goes down and visa versa ... do you know what might be the problem? Thanks again .. you are a legend! In order to swap Y direction you have to use calib_y_fact=-0.57840617. value_read.y is the value got by XBMC, so in order to revert it's direction you have to multiply it with -1. You should start with calib_y_d from 900, by doing this, pointer won't go from screen_height to 0 but from 0 to screen_height. Many thanks Andrei, I have been trying for some time to achieve this. I followed your instructions, compiled kernel and successfully calibrated for Raspian. Next I compiled xbmc using the xbian guide with your recommendations (mem/swapfile) and your patches. Everything worked great, calibrated touchscreen for the first time in xbmc (xbian). I have one problem though, I cannot 'action' via touchscreen, i can 'select' but not 'action' either with 'single tap' or 'double tap' . I recompiled changing the 'click_confines' value but that did not work, would really appreciate your help and advice. I am glad you got it working. For clicks problem, I would like to ask you to enable debug logging in xbmc(via a keyboard or mouse) in System->Settings->Debugging->Enable debug logging and then try some clicks on the touch screen. After this , please investigate the log file(/home/pi/.xbmc/temp/xbmc.log) and also email it to me so I can take a look. First off I'd like to thank you for the great tutorials. They helped me a lot! I have the same hardware like you and did everything described in your instructions. The touchscreen works perfectly under Raspbian and is also calibrated in XBMC. -the touchscreen doenst "click" in XBMC, debug-log is telling that a "drag action" is performed. -HDMI-output is fine in Raspbian at 1280x720 resolution. As soon as XBMC is started there is no HDMI signal. I already tried different resolutions, still no signal. Therefore I use analoge video output at the moment. I'm experiencing the same click-issue. Provided Andrei with the log already. cable. Withe the old cable I was not able to read the EDID data from the monitor. Now, using the new cable, "tvservice -s test | edidparser test" shows the desired info. So, what happens when you do a "tvservice -s test"? i can email more tests or info if it helps, have been test compiling code with little success it seems like the result is always mousedrag or nothing. too close to give up yet! "pointer.y = screen_height - value_read.y * calib_y_fact - calib_y_d;" equaluation. Instead deleting "screen_height-" in the sourcecode does just that. pointer.y = value_read.y * calib_y_fact - calib_y_d; . PS: the lines in the sourcecode are slightly different, search for "calib_" and you will find 2 lines that look quite similar. You don't need to alter source code. So you can see you end up with the screen width PLUS the correction, which puts it off the side of the screen. So all you have to do is set calib_y_d to the same as you screen width. Then you can tweak calib_y_d so pointer is exactly under your finger! Exactly the same applies for the other axis. Thanks for the work you've done on this, it's the only fix I've been able to find to allow touchscreen XBMC on the pi. I have an Elo touchscreen working on my pi using your patches but i have a few questions. I notice the farther i slide my finger from the center of the screen the more the cursor comes out of alignment. Not a huge amount, perhaps only a centimeter or two, but I wonder if you know what might be causing this. Also, I'd love for this to be implemented into Raspbmc or another tweaked rPi distro that just does XBMC. Would it be as simple as copying the xbmc i compiled from raspbian to Raspbmc? You have to tweak calib_x_fact and calib_y_fact to reduce this offset. Can you please post what was the xinput_calibrator output? MatchProduct "EloTouchSystems,Inc Elo TouchSystems 2216 AccuTouch® USB Touchmonitor Interface"
Option "Calibration" "426 3516 3523 686"
The math i used was 1024/(426-3516) = -0.331391586 and 768/(3523-686) = 0.270708495 for my calib x and y fact values. All I can say is that you have to tweak these numbers, in a mater of fractional part. It seems that the numbers obtained from xinput_calibrator are not perfectly fit for my formula, so that's way you have to tweak them a bit. Same screen/touchcontroler as you have. Got XBMC running, touch working. So far so good. Only having dificulties setting best resolution. Have been playing with /boot/config.txt. No better than 640x480 yet. Is it possible to drive the display with 800x480? Thanks for all the work, and the excelent tutorial. My display works fine with 1280X720 out of the box. I haven't modified /boot/config.txt. It was the HDMI-cable... Tried another one: bingo! Option "Calibration" "129 1922 326 1726"
I'm glad it is working. You can take a look at my picture from the beginning of the post to see how you should connect your cables. I have the screen from chalkboard electronics and want to do the exact thing you have. Just to clarify. Did you say your patches would work for me even though our screens are different? I haven't tested with other touchscreens but it should work. I will be glad to help you if you encounter any issues. Cool Thanks! Ill give it a try sometime soon hopefully and let you know. hi all, what solution for mouse click? i can only get drag.. If you are encountering mouse drag instead of click(but you have applied my patches correctly, for all files), please send me an email with your xbmc.log file with log level set to 2(look at http://wiki.xbmc.org/index.php?title=Log_file). I will investigate them and try to answer as quick as possible. have the same mouse- click problem. But where do i find your mail- address to provide logs ? My email address can be found at my profile. I will try to create new patches with some debug log, as soon as I will have time. Thanks for these very helpful guides. 1. XBMC does not register clicks from touch screen. I will continue to play with XBMC calibration numbers to get it to work.. and I will keep coming back here to see if there are any updates on the click situation. I do not have to same screen as you, so no wonder I am having these problems. I've Sent an email to Andrei; I've managed to get it working on my setup, although i need to double-click. I recompiled xbmc with the original MouseStat.cpp file (i.e. no patches) and a slightly modified patched version of LinuxInputDevices.cpp file. Basically removed the following lines....then re-'make' etc..
this way I can use the touchscreen with the pointer and doubleclick. I had to play with the scale and offset values in the calib file too, to adjust the pointer position to finger location across the screen. After running the utility to calibration the touch screen I am unable to find the file or directory that it advises that you edit to make the change permanent, I can get into X11 but cannot find folder xorg.conf.d or file. Hi! I'm trying this procedure in raspbmc, I have changed the kernel and the /lib folders with yours. But i can't find the file to patch in my system...in the folder of xbmc there aren't there directories! Any idea? I am sorry but Raspbmc has precompiled XBMC, so you cannot apply the patches. You have to take a fresh Raspbian image and the source code from XBMC and compile it by yourself(you can find on this blog all the information about this). I try with your solution. I have a touchscreen that in the lsusb details don't figure with "eGalax" but the driver that I have for it are for eGalax, give to me by the seller. I hope it works! I have tested the lastest build of xbian, but the touchscreen doesn't work...how to apply your patch to this distro? You have to apply the patches to the source files and then compile xbmc. You just have to follow the steps described in this post. I see that you have released an img which have all done, is this should done with my setup? I should change the name that i see in "lsusb" with your "D-WAV Scientific Co., Ltd eGalax TouchScreen" somewhere? You don't have to change anything, just play with axes calibration file. My build has a check enabled, so, if your device name does not contain "eGalax" or "Touch" string it won't load the calibration file, so you have to build everything by yourself and remove this line in the code. In this page i've seen that there are drivers of eGalax that run without xserver for arm too (http://home.eeti.com.tw/web20/eGalaxTouchDriver/linuxDriver.htm). Is this should work with raspbmc in your opinion? I don't think they would work, at least with XBMC 12.0. Maybe calibration will work but click will not work unless you double click(this is an issue with XBMC, fixed with my patches). I have tried to install these drivers as well some time ago but had no luck with them. After this, I have modified XBMC by myself to make it work. Xbian now recnognize touch! but how can i calibrate it? then you can install the latest raspbmc. once you have done this your pi should have got installed frodo 12.2 with all necessary updates. Thank you so much for sharing this! This is a great completion for my tutorial. As for the click issue it seems that I have did a mistake and the patches provided are not the correct ones for click/drag fix. On my RPI this is working fine for about five months and I can click and also drag(as it can be seen in the video). I will try to upload the correct patches as soon as I get some time. once i had the same issue. please don't ask me why, but first try to swap the hdmi-connections. if this does not work just try a different cable. for me solution one worked. Well, it all goes well until calibrating xbmc. I don't get it, like nothing happens when I change any of values. You mentioned something like patching before running make comand. get xbmc sources -> apply the patch(change some source files) -> build xbmc(run ./configure... make and sudo make install commands like pointed in this post). By 'the software' I meant xbmc sources(from the xbmc archive). "And what does it mean Revert direction of axes. This is done in the software(from patches)" - This means that I have inverted x direction and y direction from the modified code. What resolution are you outputting from the Pi to the screen? You have to set calib_x_d = screen_width(or screen_width +/- an offset) and you have to put a negative calib_x_fact value. Compiling your own Wheezy just for the Touch Support? This is really complicated. There is an much easier way. When I did this there was no way that you could use the click and also the drag in XBMC, at least for Raspberry PI, because, every click which comes from the touch screen is treated like a drag action and you have to double click to make it work. If you have found another solution please share it. I would like to ask you if this LCD touchscreen (http://bit.ly/13pNeJO) would work with the Raspberry, since I don't see any USB output or output at all for the touch positioning. The display should work as any other display, but there is no touchscreen for this one. You have to buy it separately. The usb controller is the same as mine and the display controller looks similar. you version of Raspbian+XBMC image (md5sum c59330154143d9e5e43217322bbd92ce). If I understand correctly - this is already fixed image - correct? Inside X - i have everything correct. But in XBMC x&y are still inverted. How to switch back this what you have done? And going throught sources is something to extreem for me, got lost several times. Thanks in advanve for answer! So, the image provided in this post is the latest build with the patches applied. For switching x and y axes you have to play with the touchscreen_axes_calib file, as explained in this post(part 4). You don't have to go through the sources. The sources are not in the downloaded image. So, if you have downloaded the image you have to skip to step 4 and play with the calibration file. Thanks for the good work Andrei. The patches wont build against the latest xbmc-GIT. Is it possible to to provide these patches upstream or fix them to build? Hunk #3 succeeded at 112 (offset 23 lines). I've tried a slightly different approach recently. The solution works outside XBMC therefore no compilation is required. I have written a short tutorial which works for XBIAN and RASPBMC. I use ts_calibrate to generate the calibration file, including the scale, offset and swap parameters. The a python program 'uinput-mapper' to grab/remap the dev/input/event to a new user-inputevent. With this I can then provide a 'single press' (over 250ms) if in-range and 'BTN_RIGHT' event (over 750ms) if in-range, for a long press. This is useful for context menu and returning to previous screen. My short tutorial is here, no need to compile xbian or raspbmc. i wanted to download the "eGalax_patch_for_XBMC_12.tar.gz" archive to fix my problem with the 7" eGalax-Touchscreen, but it wasn´t there anymore, so I can´t solve my problem without your help. I have everything clear, but my Touchscreen is like you said (Picture to calibrate the touchscreen). Where can I find now without the archive, the Folder with the file to calibrate the axes to calibrate it correctly? I use a 7" TFT with composite, not HDMI, is this a Problem or not? A quick answer were really good and helpful. Andrei thanks for the work. But what is the login/password for the provided compiled image. The provided login does not work. This is what I tried several times but it did not log me in. I'll try again tonight. Are you absolutely sure it is this? The only account I have ever used for RPI was this. It has a lot of new features. Dear Andrei! Greetings from Brazil! My friend, using this last image that you posted, how can I remove the AutoStart. Wish XBMC is an option in the menu of the IP. You can edit the file navigation_startup and comment the lines not needed. please help me with patches. This is the output when applying patch. Calibrating of xbmc is so hard. The patches should be used for the corresponding xbmc source files. I haven't tested them on other sources. PS. It looks like a diode next to the white connector - just in case you can't see the picture. Thanks! I took a picture for the touch controller and saw that there is a diode that you are missing. I don't know if there is some text on the diode, because it is barely visible. Option "Calibration" "1856 189 256 1888"
Then when this is workin perfect I load xbmc and compute the values. Then I have no response in xbmc. With your values in touchscreen_axes_calib file i have response but not calibrated. What do you think the values are that I need to write. This will help you understand how to get these values. I did everything just like you wrote. No luck. I'm reading tutorial for 100 time. Could it be a problem since I use composite video, not hdmi? When I look at your values, you divided values_frame/physical_frame not other way around like you writen in tutorial. I'm really confused now. How to invert axes not swap them? Maybe you have a different resolution on composite video. Check out the XBMC display settings page. Please set it like this and move the finger across screen to see how the values were changed. After this step is complete, change calib_x_fact as calculated(keeping the negative value). I'm doing it now, so we will see how it will turn out. How can I show pointer since it is hidden I cant see where it is? To show the pointer you have to edit the file /home/pi/.xbmc/addons/skin.CarPC-touch/16x9/Pointer.xml and remove the xml comment tags. Xml comment tags are at the end of the comment. I think I got it. Now it is question of couple pixels. Friend you really helped me a lot. If you will ever need anything that I am able to help you with, just ask. If you ever go to Croatia, email me. Sorry for the last sentence at the previous email. I had put the xml tags in the text and the result is that the text was truncated by Blogger. If you ever come to Romania please mail me as well. Hi, I am really struggling with this, i have downloaded your latest image but i can't calibrate the screen so when i touch the screen it is no where near,i have no idea where the files are that i need to change the values in........could you tell me where i can find them. abit more info, i have now managed to find all the files but i cannot edit any of them it says i only have read permission, the y axis seems to be correct however the x axis is inverted so left is right and right is left there is also a very big offset on the x axis........any help would be great as this is going to form part of my university dissertation. Please don't use the OpenELEC image because it is just a demo image with my touch calibration and OpenELEC filesystem is read only. As for the other images(based on Raspbian) you have to use sudo to edit the calibration file. really great tutorial. I am trying to follow up your tutorial but when it comes to downloading the patches for XMBC, google says: it's not there anymore. can you please provide a new working link? many thanks in advance. You have to change the values in /usr/share/eGalaxCalibration/touchscreen_axes_calib. How did you go about mounting the touch screen? I bought the same screen and I'm attempting to make a touch screen remote. I have created a custom frame using EPS and double adhesive band. My HDMI to VGA converter just came from ebay. It works great, I have normal resolution at last. So I copy image, insert SD card run xinput calibrator. Values are saved and working without any inverting. Starting xbmc, pointer is moved to the right and Y axis inverted and higher then finger position. When values are like this, I don't have any response. P.S. I wasn't able to make it work over composite video so I bought this converter. At least resolution is good. You said that your pointer is moved to the right, but from the values I see that you are trying to change X orientation. To move the pointer to the left you have to increase/decrease calib_x_d value. To change Y orientation, your settings should be good. Also, for moving pointer up or down you have to tweak calib_y_d value (increase/ decrease couple of pixels from 768). This means that for each x value we add 1025. This will definitely move the pointer outside of the window and that's why it is not working. please tell me if I'm anoying to you, I will stop asking. I would like to make it work. But it just won't. When I only set calib_x_d to -1 it appears like nothing happened. It still reads your values after restart, which would be almost good because X axis is inverted. When moved left it moves to the right. Y axis is OK with your values. I tried to put (-) in front of your calib_x_fact value, then it goes off the screen. I would like to know what am I doing wrong. You are not annoying me, but I don't have much time and maybe my replies will be delayed. It is good that your Y is ok.
Andrei, I am having the same exact issue as Jasmin, Y is perfect with your values but X is inverted, what was your solution? If you have X axis inverted you have to set calib_x_fact to a negative value and calib_x_d equal to your X resolution. Please read the post at step 4. Duh! I read that and for some reason it didn't process correctly in my head. It's working now. Thanks! If you don't need xbmc you should use xinput-calibrator to calibrate your touch in Raspbian. eGalaxCalibration folder is only for modified version of XBMC. I gave that a try, and for some reason axis are still inverted (up moves down, down moves up), and touch is still unbelievably inaccurate, almost to the point where it's unusable. Please add me to GTalk or Skype(andrei.istodorescu) or YM(bboyandru). What values did you put for the overscan (left, top, bottom, right) in your /boot/config.txt to fill correctly the screen ? I have't modified the overscan values. Hello, i have downloaded your image(Pre-Loaded)and mounted on the SD Card. Now how do i go to calibration mode and store the new values after calibrating as per my size? 10.1 size touchscreen egalax. I ahve used image provided by you but my raspberrypi does not boot and just PWR LED is glowing. Can you please suggest anything...? I suspect there is an issue with the firmware that I am using, which is about 1 year old. On my RPI Model B 512 is working very fine, but I heard that there are issues with newer boards. The issue is that on the newest firmware(which works on all RPIs) there is a black screen behind XBMC, so Navit can't be seen. I need to investigate this but I am sorry that I do not have time at this moment. My axes are really messed up. When I tap the upper left corner, the cursor is placed In the upper right. Tapping upper right puts it in the lower right, tapping lower right puts it in the lower left. And tapping the lower left puts it in the upper left. Option "Calibration" "1958 69 82 1901"
Sorry for the delay, please add me on Gtalk. I have a little problem with the usb cable. My cat played with it and cut through 2 of the cables. Do you know how the white plug to the usb connector for the touchscreen is called, the one from raspberry usb port to the touchscreen control panel. Will this tutorial work on this touch panel? I used your image and it works fine, but my problem now is that my wipi dongle wont work anymore with your image. I know it's now related but I just need help on how to install the driver for my driver with compatability to your given image. Thanks in advance. Please tell me the exact model of your wifi dongle, or what kernel module you need for it. I tried your XMBC image (https://docs.google.com/file/d/0B__Rs5JF53-kckJyak1BVnBtTEE/edit) for the 7"
Touch Screen. I flashed the image on to the SD card using ApplePi-Baker. The image copied well with no errors. Is it because the SD Card was not flashed properly? Your help will be appreciated. Maybe you haven't flashed properly. Please use sync to be sure that the copy operation is finished(if you are using dd on linux). Are there any new images for OpenElec? I don't have other OpenELEC images and also haven't used mine more than once. Please ask the seller which type of controller does this board has on it. I know that eGalax are working and I am sure that there are a lot of controllers supported by the linux kernel. thanks for your repsonse, the manufacturer told me like you and hi gives me the link to download the egalax driver! how do you connect ACC to 12v to have automaticaly switch to AV2 for a reverse camera? have you a pic for an example? Great, so it will work out of the box. I have to configure that because I have a 5 inch screen, not a 7 inch as you. I will try with reverse light bulb but can I use thE 12V pin on J3 (power supply input connector)? You need to link the reverse light bulb to the ACC pin to be sure that when you put the car into reverse the display will switch to AV2. As for powering the display controller, you can also use that pin. ok, I will try tomorrow, next step : install linux driver eGalax and mount (try!) your xbmc image! Could you just upload a img file from your sd card so we can download that and it works? I love this project that you have put so much work into. I'm currently using this same touchscreen display and I have tried all 3 .img files using Win32DiskImager and Fedora Remix Installer. After it writes the image into the correct partitions on my SD card I plug it in. When it attempts to boot I get no video and just a single green flash from the ACT LED while the power LED remains lit and no other activity. I read from multiple sources that this could be from having a 512MB model instead of the 256MB model. Is this potentially the problem? Any help would be greatly appreciated. Actually I did get the beta from March 24th to boot. I am modifying some of the system right now since I personally don't have a GPS device for the Navit system. It's running great so far. I have not tried the touchscreen yet but I'm sure I'll get to that within the next two days. Thank you for this wonderful software! Thank you for your info on this matter, I would really like to know how to calibrate the touchscreen for XBMC, I have a Raspbian+XBMC setup with a Newly compiled XBMC that I have installed, the touch screen works great within Raspbian, but now when I run xbmc one axle are swapped (Up=down, Down=UP, and it's not calibrated right, I have tried every google search I've found but nothing works, I have changed the values in eGalaxCalibration folder to see if it makes any difference but not even a bit. I have also done the following #if(strstr(m_deviceName, "eGalax") || strstr(m_deviceName, "Touch")) I added a # to this line if this is right to the comment in readme file, Excuse me but I'm not a linux user but are learning.. I have done the patch after I have compiled & installed XBMC. Any info will be appreciated. But I'm stuck in the second step. I can not find the path to XBMC? XBMC source code can be obtained from their downlaods page or from xbmc git. Please have a look at my latest image from the downloads page, as I have the source files of XBMC Gotham 13.1 in the home folder. Andrei thank you, I could not find the directory because I had just installed xbmc with "apt-get install xbmc". Can you make the skin with vw logo? I'm unable to change around the cables for my monitor because they're directly wired into the back of it. Is there a software-only way of changing the axis around? I'm currently running the latest xbmc. Hi, Thanks for all of your hard work. I tried to download the image from the downloads link but it takes me to download google drive. you describe me where i can do it. where i can take it out the autostart? I´d like to thank you for your tutorials. The video size is 1280x720. If you need another resolution please speak to idorel@gmail.com, as he create it. have you remove the completed image for download? Yes, please see the latest post. You need a fresh Raspbian image and then install my CarPC update. Hi, sorry for my english, using the google translator. I installed your image and works fine, but I can not calibrate the screen, the lower margins are not. If I change the resolution to 1280x720, the lower margins appear, but when it finishes calibrating the screen, does not work well. Have any other image that might work for me? Thank you very much. Thanks for responding. I followed the steps you recommended to me, but the screen is not well calibrated. but in my case the y-axis is mirrored. For example: if I touch the Radio-button, xbmc opens the Video Menu. Is there a point to change this issue in the "/home/pi/touchscreen_axes_calib"-file? heb opgezet met Boblight, OpenElec en WS2811/WS2812 LED strips! My Pi work in combination with a Faytech 10''. Calibration, no Problem. But only mouse draft, no klick. I use your latest carpc-update with the latest debian weezy. Chris, I've downloaded and used your files for the RPI 2. While the touchscreen displays, I am unable to use touch input. Can you offer any advice? Hello Can I make an aplicative to do something interactive? and where did you bought your module ,does the touch screen works all day if it were necessary? I have been fighting this for a week. Still cant get pi to accept input from the touch screen. Tried your kernel, and compiling my own. also tried your complete image, and your updates. when I try to install from your update as you said in another post, carpi install.sh it crashes. I once got it to boot to xbmc although I had no input. I tried your complete image and it won't boot. Can anyone help me get Acer Touchscreen T232HL working with RPI? I would like to thank you for the efforts you have made in writing this post and the download links you just provided. I am hoping the same best work from you in the future as well. Really the blogging is spreading its wings rapidly. have somebody dragging working in navigation? its jessie and kodi 15.2. Io ho la distro Raspian Pixel in cui ho letto che ci sono i driver per il display eGalax. Come si attivano/installano, o bisogna ancora ricompilare il kernel? I have the distro Raspbian Pixel when I read that there are drivers for eGalax display. How do you activate / install, or you have yet to rebuild the kernel?